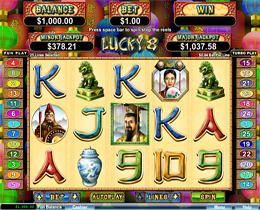 Lucky 8 is a progressive video slot consisting of 5 reels and 25 pay lines. It has a fortune based storyline theme to it with great features which include Free Spins, the Win-Win Feature, Two Progressive Jackpots and Multipliers. The Emperor, Imperial Warriors, The Great Wall, A Ming Vase and the high valued symbols of playing cards. The Emperor is the Wild and will multiply the winnings by up to 8 times when it is part of any winning combination. The Lucky 8 icon is the Scatter and when three or more of them show up anywhere on the reels, it will trigger the Free Spins feature. 8 Free Spins will be rewarded and this feature can be retriggered. In the first Bonus game, 8 Free Spins are awarded with 2, 3, 5 or 8 Multipliers awarded on each spin. When a player's overall win from the Free Spins round is less than 8 times the triggering bet, then the Win-Win feature will be triggered and make up the difference. 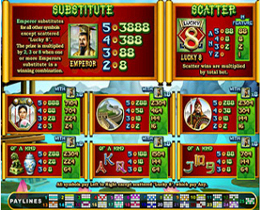 The total amount of winnings depends on how much the player won during the Free Spins round.